KU’s last win over OU came on Oct. 4, 1997, when the team claimed a 20-17 decision at home. The Jayhawks have lost the last four meetings with the Sooners by at least 37 points, failing to score more than seven points in each contest. Over that span, Oklahoma has scored at least 41 points in each outing. The Sooners have won 31 of their last 33 games (.939) against Big 12 opponents dating back to the 2015 season. KU will receive the opening kickoff at No. 6 OU. Bender-to-Booker connection gets KU in 3rd & 1 at own 44. KU emptied the backfield on 3rd & 10 and when Bender tried to take off OU stuffed him at line of scrimmage. Kyler Murray ranks 1st nationally in pass efficiency rating (212.9), yards/pass attempt (12.3), and yards/completion (17.4). With OU on verges of TD drive, Mike Lee emerges from a pile with the loose ball after a fumble. Lee also caused it with a strip. Jayhawks get 5 yards on 1st down from Herbert. Pooka Williams breakaway speed is alarming in the open field. Got to be tough for defenders, too, as they've seen 3 different KU RBs involved early. 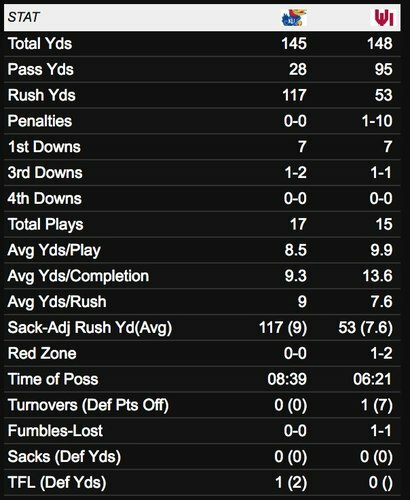 10 KU running plays so far and 3 passing plays. 86 rushing yards. 16 passing yards. KU on verge of red zone on 2nd series. Wow. Pooka Williams breaks a tackle in the backfield and explodes for a 23-yard rushing TD. Pooka brought the moves, but the #KUfball ground game as a whole dominated that drive. Smashed it straight ahead at the OU defense over and over until they wound up in the end zone. 7-0, KU. Kyler Murray too tricky/fast in open field. Takes it in for a 7-yard TD. A blown pass coverage earlier in the drive led to a 40-yard pass down the right side to Morris. 13 runs for 117 yards in 1Q a huge part of this great start for KU. Also Mike Lee robbing Kennedy Brooks of the ball on 1st & G.
Does Beaty get his job back if we win? 3rd & 11 Bender pass to Booker only gets 6 yards. in the series. It is OU’s longest active winning streak against an opponent. the start of the 2000 season, the Sooners are 59-11 (.843) in the month. So Tre Brown is sort of filthy in the open field. Kyler Murray may not ever have an easier TD throw in his life. Carson Meier wide open in the end zone for 20-yard score. OU's 3rd possession goes 65 yards in 7 plays. How come we can’t get plays called! Personal foul and 15-yard penalty on KU OL Antione Frazier.